People made him his own little treadmill. When a tiny owl was found in Alberta, Canada, he was in terrible shape, unable to fly or even stand up. In late September, he was rescued by the Alberta Institute for Wildlife Conservation (AIWC) and taken to Marda Loop Veterinary Center. Since then the brave little northern saw-whet owl is learning how to walk again - on a makeshift treadmill. This particular type of owl - known for his cat-like face and bright yellow eyes - is highly nocturnal and reclusive, hardly ever seen by human beings. But the wildlife rehabilitators from AIWC are getting to know this little guy up close. One of his rescuers gently holds his little body while another pulls the purple walkway to give him practice. The physical therapy is helping to improve the owl's range of motion and encouraging him to keep his head straight. "He's doing better now, there's notable improvements, but it still will be a long road of recovery," Holly Duvall, executive director of AIWC, told The Dodo. 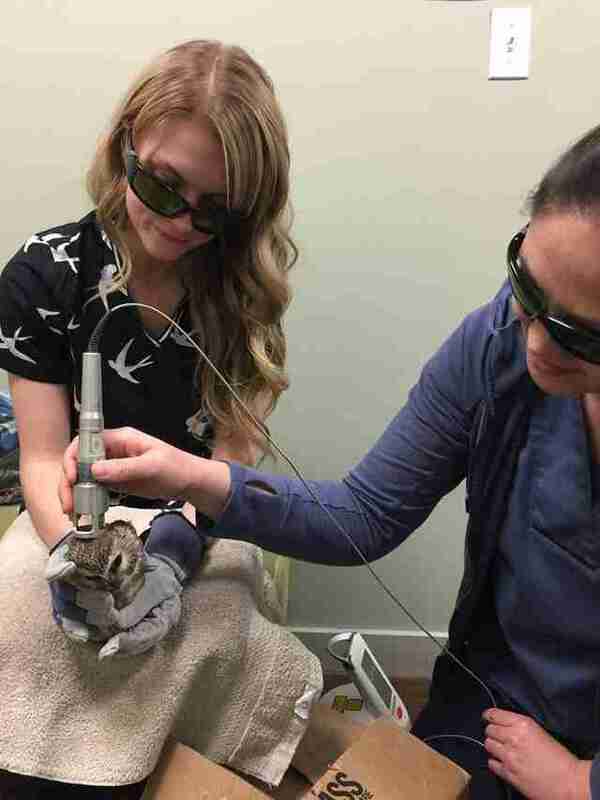 The vet clinic is also donating laser therapy to the owl, which helps relieve pain, Duvall said. With all this support, we hope this little guy will be back on his feet, and taking flight again, soon. To help AIWC rescue animals like this owl, you can support the group here.